Butterfly Threads: How Big is a Scrap? How Big is a Scrap? Or perhaps I should ask, "How small is a scrap?" In this world of quilting and fabric and cutting and sewing and cutting again...when does the fabric become a 'scrap'? Is there a certain size or shape that declares "I am now a scrap!" or rather do the number of times it has been used qualify it as a scrap rather than a fabric? I wrote this post on Buying Fabric which pretty much cover everything (and then some) about my perspective on choosing fabrics at the store. It's a question I get on a regular basis. And I wrote this post on Choosing Fabrics for a Project. This isn't the only method I use, but it's a good one for pulling the best combinations from your scrap bin! One of the most popular posts I've shared was about THE LIFE CYCLE OF A FAT QUARTER BUNDLE. This covers all aspects of the life of a piece of fabric once it lands in my sewing room. Since 'scraps' are usually my GOAL rather than my leftovers, I might have a different perspective than many of you. Or maybe not? What do you consider a scrap? For myself, scraps to me are the smallest bits of stuff I cannot seem to use somewhere else, because the possibilities are Endless! That's a good question .... I consider a scrap starting from 2 or 3" ! Ah yes, the age old question! I don't generally sort by color, but rather by size. I have large (between a fat quarter and a fat eighth), medium, small and "scrids". Scrids are very small pieces which are good for appliques only, but I have baskets FULL of them! Sort of like the box of string at our summer house that was started by my husband's great uncle in 1905 which has a note written on it that says "string too short to save". Yup, I'm a yankee through and through. That's a great question and made me really think. I'd have to say 3" or less. Anything bigger and especially if I love the fabric, I'd be afraid if I cut it up I'd regret not having a larger piece of it for something someday. But your other thought of having used it too many times does make it a candidate for the scraps sooner than later, unless I really love it! Ah, one of those perennial questions without a definitive answer like wash/don't wash, steam/no steam, or sort by color/size. I'm going back to read the earlier posts. BTW, I use a modified Bonnie Hunter scrap saver system (I keep 3" scraps and strips) and sort cut up scraps by size but larger pieces by color. the smallest scrap I save is about a 2 1/2" square and a 1 1/2" strip. I was asked this at my workshop this week so I just thought about it. I am the messiest scrap keeper - it's all in bins - either strips or what I call "chunks" which are pieces smaller than a FQ. 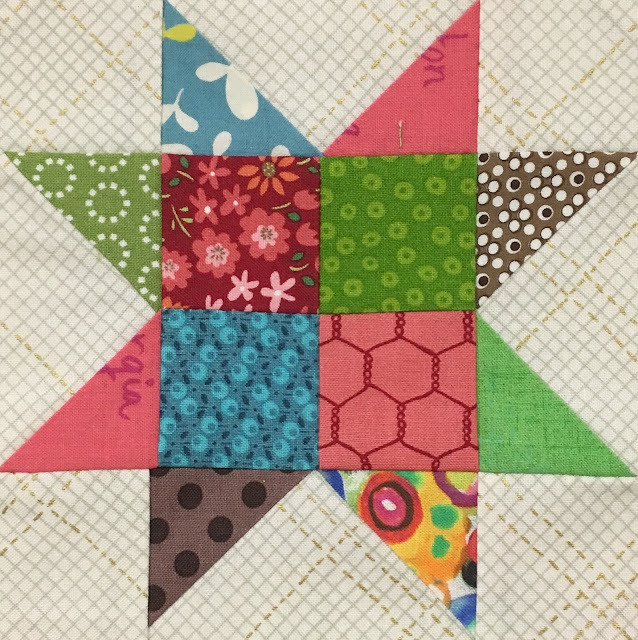 by my side, my small scraps are 1 1/2"... squares or strips..